The instructions below assume that you’ve already signed up for your Dropbox account and have installed the Dropbox application on your Mac. How to share any file, in any folder, inside your Dropbox folder, with another person even if that person doesn’t have their own Dropbox account. This will copy the link into your clipboard. Go to your email application, compose a new email message and then paste this address (aka link) into the email message and send the message. I want to emphasize that the recipient is able to download and then edit the file, but this feature doesn’t give them a way to easily send the file back to you. So, this is more of a file distribution capability. It doesn’t offer two-way file exchange. 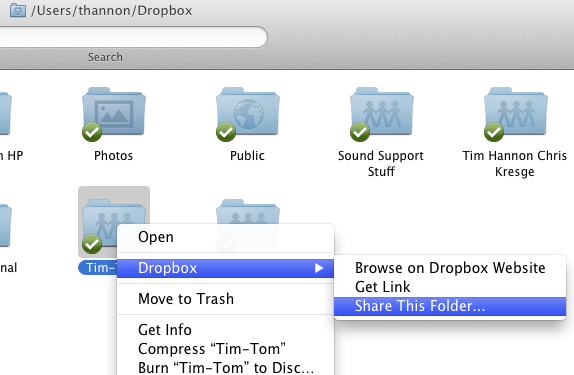 This feature is very similar to sharing a file using the Public folder. In fact, I see only one primary difference. This Copy Public Link feature allows you to leave a file inside of a shared folder while also sharing it with a person who typically can’t access files in that shared folder. 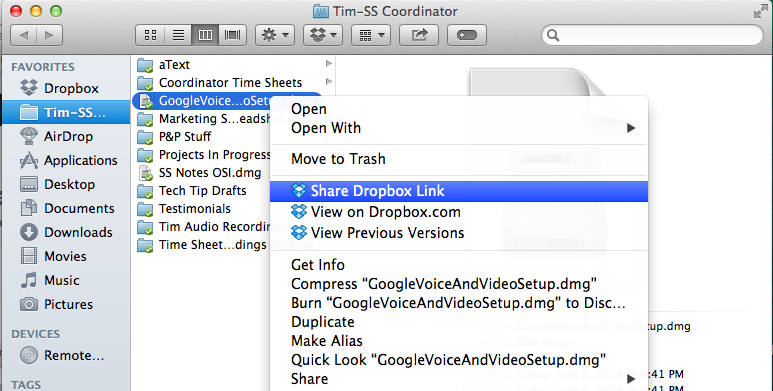 Additionally, Dropbox has their own article about using this feature. Your web browser will open and you’ll be taken to the Dropbox web site. Login to your Dropbox account if you aren’t already logged in. In the field named “Invite collaborators to this folder” type in the email address of another person. I entered Tom’s email address. Type in an optional personal invitation message and then click the “Share Folder” button. This will send an email that includes the invite. The email recipient can click on a link in the invite email to accept the invitation which grants them access to this folder. If the recipient doesn’t already have their own Dropbox account then they’ll be prompted to create a free account. If your invitee accepts your invite then you’re notified via email. At this point, you’re ready to easily share files with your invitee via this folder. Every time a file is adding, edited or deleted then a notification will pop-up on your screen. This invitee can’t see any other folders that you have in your Dropbox account. Happy file sharing. Dropbox has their own article about this feature. Here are answers to some frequently asked questions about this folder sharing feature. This information is taken from Dropbox’s help article. If you chose to sign-up for Dropbox please consider using this link to do so, since I’ll earn a referral bonus. Thanks. Read more about DropBox, file link, file sharing, instructions, setup, shared folder.